Thomas Lawton was born in Bolton on 6th October 1919. His father, a signalman on the Lancashire and Yorkshire Railway, left home when Tom was 18 months old. His mother, a weaver, took her son to live with her grandfather, James Riley. Riley, was a passionate football fan who had himself been a good amateur player. He had encouraged his four sons to play football. With his mother working a 12 hour day at Harrowby Mill, Lawton spent his spare time playing football with his grandfather and his four uncles. He later explained in The Complete Centre-Forward: "We made goalposts with coats and jackets and we'd just play any time of the day." From the age of ten Lawton played for his grandfather's team. "On Sunday mornings, after church, there was usually a game organised against a team from another part of Bolton with sidestakes... We would get a tanner a man if you were on the winning side... A tanner, you see, paid for their Saturday night out, a couple of pints and a packet of fags." Lawton was too poor to be able to afford to watch Bolton Wanderers play. However, like many young lads, he would see the last part of the Football League games for free when they opened the gates in the second-half. Lawton's great heroes were Ray Westwood and Harry Goslin. However, the man he tried to imitate was Dixie Dean, who played for Everton at that time. In 1933 Lawton was selected to play for the North against the South. Over three seasons he had scored 570 goals for his school and Hayes Athletic. Lawton was expected to play for England Schoolboys but despite scoring a hat-trick in the 7-0 victory he was not selected for the game against Scotland. Lawton later remarked: "I never was capped at schoolboy level. I cannot understand why not. It was one of the biggest disappointments of my life." Teams in the Football League were aware of Lawton's achievements. At that time clubs could not sign players as professionals until the age of 17. Therefore, when Lawton reached the school-leaving age of 14, he was offered an amateur contract plus the offer of a job until he was old enough to join the playing staff. Bolton suggested they could get him a job as a delivery boy at a wage of 7/6d (37p) a week. James Riley, who negotiated on Lawton's behalf, rejected the offer. Liverpool, Blackburn Rovers and Bury were also interested in signing Lawton. Sheffield Wednesday offered 10 shillings (50p) a week to sign as an amateur with the promise of a job later. However, it was Burnley who signed Lawton by offering him a job as an assistant secretary on the generous wage of £2.50 a week. The Riley family was also given a rent free house close to the Burnley ground at Turf Moor. At first, Lawton played for the "A" team. He scored so many goals for the club, that in September 1935, just before his 16th birthday, he was selected for the reserve team against Manchester City at Maine Road. Later that season Lawton was given his first-team debut. He therefore became the youngest centre-forward ever to play league football at 16 years 174 days. Lawton failed to hit the net in this game but in the following match against Swansea Town he scored two goals in a 3-1 win. After the game Lawton attempted to buy a copy of the Evening Post at the railway station to see the match report. Alick Robinson, the captain of Burnley, stopped him from doing this: "Don't think too much of yourself. You've a long way to go and a lot to learn." The Burnley trainer, Billy Dougall, took him home and told his grandfather: "He's not to see the papers. Take out the sports page and throw it on the fire." Lawton's next game was against Manchester United. He was marked by the experienced George Vose. The Daily Dispatch reported: "Lawton, 16-years-old but strong and plucky, had few decent passes and was practically blotted out by Vose, who was at his best for this important game." Lawton's form was so good that his grandfather attempted to negotiate Lawton a £500 signing on fee. However, at the next meeting Charles Sutcliffe, the secretary of the Football League, was there and he threatened to ban Lawton for life unless he withdrew his demands. On his 17th birthday Lawton signed as a professional with Burnley. He received £7 a week, with bonuses of £2 for a win and £1 for a draw. At this time the average working man got about £4 a week. The following day Lawton made his professional debut in a game against Tottenham Hotspur. A crowd of 19,260 at Turf Moor saw Lawton score a goal in the first minute of the game. He then added two more before half-time and guaranteed a victory for the home side. He continued to score goals on a regular basis and within weeks of signing as a professional, several clubs, including Everton, Arsenal, Wolves, Newcastle United and Manchester City made offers for Lawton. In December, 1936, Everton signed Lawton for a fee of £6,500. It was a record fee for a teenager. To encourage him to sign for the club, his grandfather was given a job as deputy groundsman at Goodison Park. One of the attractions of the deal was that Lawton now had the opportunity to play with Dixie Dean. When they met for the first-time, Dean put his arm round Lawton and said: "I know you've come here to take my place. Anything I can do to help you I will. I promise, anything at all." Dean was thirty years old and after suffering several serious injuries, he knew that there was not much time left for him at the top. Dean kept his promise and spent a lot of time with Lawton on the training field. Gordon Watson, who played at inside-left for Everton, later recalled: "Lawton and Dean used to work together under the main stand, Dean throwing up a large cased ball, stuffed with wet paper to make it as heavy as a medicine ball". Six weeks after joining the club, Lawton was brought into the first team for an away match against Wolverhampton Wanderers, as Dixie Dean was rested prior to a fifth round FA Cup tie with Tottenham Hotspur. Lawton found it difficult playing against the England centre-half, Stan Cullis, however, he did score a goal 15 minutes from the end. Everton drew the FA Cup tie with Tottenham Hotspur 1-1 and it was decided to play Lawton alongside Dixie Dean in the replay. In the second minute Lawton scored with a tremendous shot from outside the penalty area. Dean turned to Joe Mercer and said: "Well, that's it then. That's the swan song. That's the end of it." Dean realised that it would not be long before this talented player took his place in the side. After twenty minutes Albert Geldard provided the centre for Dean to put 2-0 up. Dean later added a third but Tottenham scored four to go through to the next round. 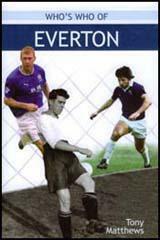 In the next game Everton beat Leeds United 7-0 with Dean and Lawton both scoring good goals. At the end of the 1936-37 season Dean had scored 24 goals in his 36 league games whereas Lawton had three in ten. John Jones, Everton's young full-back, later argued that it was Dixie Dean was the main coach at the club: "Dixie was the boss. Young players at Everton had to keep in order otherwise they were pretty soon stepped on... It was Dixie, along with a couple of England centre-halves, Charlie Gee and Tommy White who ran the show. Occasionally they'd call a meeting and they'd be telling the youngsters what to do. It was the best method of coaching I ever experienced." Lawton agreed but claimed that: "All they ever said was make sure you pass it to a man in the same shirt." At the beginning of the 1937-38 season Lawton played at inside-right and Dixie Dean at centre-forward. The pairing did not work and Everton failed to win a game when they two men played together. On 8th September 1937, Dean was dropped and Lawton replaced him as centre-forward to play against Manchester City. Lawton scored in the 4-1 victory and Dean only played in two more games for Everton before leaving the club. Lawton became the youngest player, 17 years, 362 days, to score in a Merseyside derby when Everton played at Anfield on 2nd October 1937. Liverpool lost 2-1. It was their first win at Anfield since 1931. Lawton also got great pleasure scoring against a Bolton Wanderers side that included his two boyhood heroes, Ray Westwood and Harry Goslin. Lawton also scored against Leeds United, which made it 5 in 8 matches and Everton began to climb the table. On the Monday after the Leeds game Lawton upset the senior players by walking into the dressing room and saying "morning boys". As a result Lawton was thrown fully-clothed into the bath. Everton finished in 14th place in the 1937-38 season with Lawton ending up as the club's top marksman with 28 goals in 39 league games. He was also the top scorer in the whole of the First Division. This was an amazing achievement for someone who was only 18 years old. Lawton hoped to be selected for the England tour of Europe but was unable to replace the current two centre-forwards, Ted Drake (17 goals in 27 games) and Frank Broome (20 in 38). 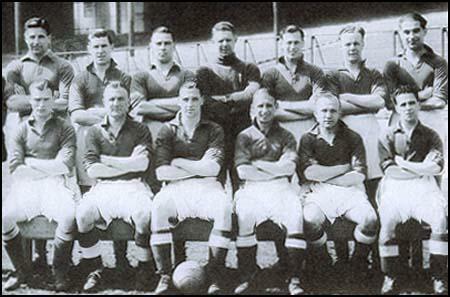 Everton won the first four games of the 1938-39 season. The fifth game was against Arsenal, the current league champions, at Highbury. After 15 minutes Lawton passed to Alex Stevenson, who scored from close range. Lawton got the second in the 38th minute. George Casey of the Sunday Pictorial described it as "another wonder goal" from Lawton. In the second-half, Bryn Jones, scored for Arsenal from 30 yards. However, Everton held on to their lead although Lawton suffered a battering from Wilf Copping. Lawton constantly beat the Arsenal defenders in the air and Copping warned him that he was "jumping too high" and that he would have to be "brought down to my level". As Lawton later recalled: "Sure enough the next time we both went for a cross, I end up on the ground with blood streaming from my nose. Wilf was looking down at me and he said 'Ah told thee, Tom. Tha's jumping too high!' My nose was broken. When Arsenal came to Everton, Copping broke my nose again! He was hard, Wilf. You always had something to remember him by when you played against him." Charlie Buchan in the Daily Chronicle argued that Lawton was the main reason for Everton's 2-1 victory: "Lawton had a lot to do with the success. He beat Joy for the ball in the air, kept the wings moving and was ever dangerous in front of goal." 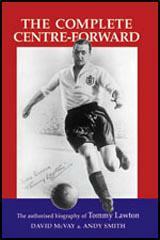 Lawton won his first international cap for England against Wales on 22nd October, 1938. The England team that day also included: Wally Boyes, Wilf Copping, Len Goulden, Eddie Hapgood, Stanley Matthews and Alf Young. Lawton scored in the 27th minute but Wales surprisingly won the game 4-2. Four days later Lawton scored for England in the 3-0 victory over FIFA. The following month he also scored in both games against Norway (4-0) and Northern Ireland (7-0). That season Everton won the First Division league title, by beating Wolverhampton Wanderers by four points. Lawton was the club's top marksmen with 34 goals in 38 games. For the second season in a row Lawton was the top scorer in the First Division. As Tony Matthews points out in his book, Who's Who of Everton: "Ideally built for a centre-forward, Lawton was a master in the air, brilliant on the ground, a constant threat to defenders and was universally regarded (by players, managers and coaches alike) as one of the greatest of his era." In the 1939-40 season Lawton scored in the first two games of the Football League against Brentford and Aston Villa. However, on Friday, 1st September, 1939, Adolf Hitler ordered the invasion of Poland. The following day Lawton scored in Everton's 2-2 draw with Blackburn Rovers. On Sunday 3rd September Neville Chamberlain declared war on Germany. The government immediately imposed a ban on the assembly of crowds and as a result the Football League competition was brought to an end. On 14th September, the government gave permission for football clubs to play friendly matches. In the interests of public safety, the number of spectators allowed to see these games was limited to 8,000. These arrangements were later revised, and clubs were allowed gates of 15,000 from tickets purchased on the day of the game through the turnstiles. The government imposed a fifty mile travelling limit and the Football League divided all the clubs into seven regional areas where games could take place. Lawton who was only 20 years old in September 1939, was at the peak of his form during the Second World War and scored 152 goals in 114 games during the conflict. He also netted 24 times in 23 wartime internationals. The British Army invited some of the best footballers to became Physical Training instructors at Aldershot. This included Tommy Lawton. Other top players at Aldershot included Joe Mercer, Cliff Britton, Matt Busby, Don Welsh, Billy Cook, Arthur Cunliffe, Archie Macaulay, Norman Corbett, Bert Sproston and Eric Stephenson. Lawton returned to Everton after the war, but many of their top players had been forced to retire and the club finished a disappointing 10th in the 1946-47 season. After scoring 69 goals in 90 appearances for Everton, Lawton was sold to Chelsea for £11,000 in November 1945. On 27th November 1946 Lawton scored four goals in an international game against Holland. He added four more in a game against Portugal on 25th May 1947. Lawton scored two of the goals in the 5-2 win over Belgium on 21st September and one more in the 3-0 victory over Wales in October. Tommy Lawton played with both Tom Finney and Stanley Matthews in the England team. He was once asked to compare them as players: "Tom Finney always looks deadly serious, but his football has an impish character about it. Much of his footwork resembles that of Matthews, but Finney cuts in more than Matthews does, and is also a goal-scorer, whereas Matthews is content to let others do the scoring. Tom can also play equally well on the left wing, and has shown that he is equally skilful at beating an opponent on the inside as well as the outside. Like Matthews, he has a tremendous burst of speed which helps him to float away from his pursuers." Len Shackleton, played a few games with Lawton for England: "Some of the greatest names in football have filled the centre-forward position and the best of them, in my time, was Tommy Lawton. Tommy, in his prime, had everything required of a centre-forward. A terrific shot with either foot, strength and accuracy with his head, the perfect physique, wonderful positional sense and a quickness off the mark that was unexpected in one of his build." Wilf Mannion was another fan of Lawton: "I cannot recall any centre half who could keep him (Tommy Lawton) in check in his international days-I have seen little of him since and, for all I know, he may be as difficult to control as ever. Tall, powerful, agile and crafty, Tommy was the complete centre forward. He made goals; he scored them with monotonous regularity. With his head or with his feet, they came all the same to Lawton. If one man can do it, so can others. But they must put in the necessary work at practice and I am certain that Lawton was never a shirker in that respect else he would never have obtained the fame he did." Lawton found it difficult to settle in London. He also came into conflict with Chelsea manager Billy Birrell and asked to be put on the transfer list. Lawton scored 30 goals in 42 games for Chelsea before being transferred to Notts County, a club playing in the Third Division at the time, for £20,000 in November 1947. That season the club finished in 6th place in the league. Although he was only 29 years old, Lawton played his last game for England on 26th September 1948. The game against Denmark ended in a 0-0 draw. Lawton had the amazing record of scoring 22 goals in 23 games for his country. There is no doubt that Lawton's decision to play in the Third Division definitely hurt his international career. In 1948 he published his first book, Football is my Business. It was not until the 1949-50 season that Lawton's goals helped Notts County win the Third Division championship. County struggled in the Second Division and in March 1952 Lawton, who had scored 90 goals in 151 games for the club, was transferred to Brentford. Now in his thirties, Lawton failed to impress at his new club and over the next two seasons only managed to score 17 goals in 50 games. In September 1953, the 34 year old Lawton was given another chance to show that he could score goals at the highest level when he was transferred to Arsenal in the First Division. Lawton was clearly past his best but he still managed to score 13 goals in 35 league games before joining Kettering Town as player manager. He had scored 232 goals in 390 Football League games during his career. In 1954 Lawton published the book, Soccer the Lawton Way. This was followed by My Twenty Years of Soccer (1955). In May 1957 Lawton was appointed manager of Notts County. However, it was not a successful year and at the end of the 1957-58 season the club was relegated to the Third Division and Lawton resigned. He was out of football until being appointed as manager of Kettering Town in November 1963. However, the job only lasted until April 1964. Lawton also worked as coach and chief scout at Notts County (October 1968 - April 1970) and as a publican in Lowdham. He also published his autobiography, When the Cheering Stopped (1973). Tommy Lawton died in Nottingham on 6th November 1996. At Folds Road we used to chalk a set of goal posts on the wall and practise shooting - in or heading-in. We used only tennis balls at that time, and looking back I feel that such practice helped me considerably to become such a deadly "shot" with my head when I graduated to first class football. Lawton, 16-years-old but strong and plucky, had few decent passes and was practically blotted out by Vose, who was at his best for this important game. At this stage up stepped Master Lawton to crack a shot so hot and fast, so rushing, that goalkeeper Hall saw nothing of it. It was a crackerjack shot and taken with Lawton's well-known first-time fury of pace. I found it rather embarrassing to read about myself in the gossip columns on the sports pages of the newspapers. This and that club was mentioned as being interested in me, but as far as I was concerned I was a Burnley player and very happy to be one. I also knew that there was a lot more for me to learn, and at Burnley I was learning it. We were a happy club and I found excellent teachers at Turf Moor. My first intimation as to what was afoot came when I was in the club office by myself one day. Mr. George Allison, then the manager of Arsenal, telephoned and asked for Mr. Alf Boland, the Burnley secretary. "Mr. Boland is not here at the moment," I replied, "but this is the assistant secretary speaking. Can I help you?" Imagine my surprise when Mr. Allison replied that he wanted to make an offer for Tommy Lawton and would be telephoning again. I was in a daze! And the daze got worse as more telephone calls came in. Manchester City, Everton, Newcastle United, Wolves. All were interested in Tommy Lawton-in me! Arsenal at that time - in fact Arsenal today - were the glamour club of football. Almost every player wanted to play for them, and the thought that they were interested in me made me feel very proud. Little did I know that their bid was to fail and that it was to be many years later before I was to sign on the dotted line for the famous "Gunners". Actually, I learned later that eight clubs had tried to sign me, but eventually, on 31 December 1936, I was called into the Burnley boardroom and there saw Mr. Will Cuff and Mr. Tom Percy, two Everton directors, with Mr. Theo Kelly, the manager. Mr. Tom Clegg asked me whether I would agree to sign for Everton, and after a conference with grandfather I said I would. So the deal was completed, and it was agreed that grandfather should accompany me to Everton and have a job on the ground staff. Some of the greatest names in football have filled the centre-forward position and the best of them, in my time, was Tommy Lawton. Tommy, in his prime, had everything required of a centre-forward. A terrific shot with either foot, strength and accuracy with his head, the perfect physique, wonderful positional sense and a quickness off the mark that was unexpected in one of his build. Tommy Lawton possessed a rocket of a shot and, like all great players, could hit the ball equally well with either foot. He was lethal in the air and, most surprisingly for a centre-forward of the time, had all the ball skill and creative prowess of the most mercurial of inside-forwards. Tommy was a goal-getter, a towering athlete with a seemingly elasticated neck that enabled him to rise that inch or so above defenders, which he did often to devastating effect. With his shirt unbuttoned so that it appeared to be sliding off his shoulders, a sharp flint-like face, hair greased back to form a black V off his forehead and long stringy legs protruding from his baggy shorts, he cut an unmistakable figure on the pitch. Tommy was a star but without all the designer trappings of today's footballers. He'd dress in a long, belted overcoat with slightly spivvy shoulders, double-breasted pinstriped suit and immaculately polished shoes. The only indication that he was different from the fans who worshipped him from the terraces was his trademark gaudy ties, which gave him the air of a Hollywood gangster. Tommy was a handful for defences; he put himself about, as they say. He knew a centre-forward was expected to run through a brick outerhouse if need be and he never shirked from his responsibilities. His dominance in the air was unsurpassed and he would often hurl himself at the opposing goalkeeper and centre-half when the odds were against him winning the ball. If he didn't win the ball, neither did the goalkeeper. What resulted was a scramble in the goalmouth between him and the defenders that reminded me of the scrummage to get on the last tram of the night. When England play Scotland at Hampden, England come out first and have to stand on the field while the famous Roar greets the Scots. And that roar is really something. It seems to start behind one goal and then sweep right round the vast bowl that is Hampden. It makes your heart thump and your knees go weak. You can almost see and feel the roar, but the amazing thing is that as soon as the game started the noise didn't worry me at all. Mind you, I did think the fans would shatter the heavens when Dougal put Scotland ahead, but twenty minutes from time, Pat Beasley, playing his first international equalized, and I had the feeling we were getting on top. The ball was coming through from our wing half backs-what great ones they were that day!-and then, with hardly any time left-it was actually seventy seconds!-Len Goulden sent Stan Matthews away. He skated past McNab, and as we all pressed into the attack, Stan evaded Cummings and sent across a perfect centre. As soon as I saw it leave his boot I knew it was mine, and sure enough it was. I hit it perfectly with my head and the ball simply fizzed into the net. It was a great moment. We had beaten Scotland and the Hampden Roar. I was one of the fortunates who, by reason of my retention in this country on Army service, was able to get in my weekly game throughout the period of hostilities. And incidentally there was periodical hostility from people who thought it wrong that fit, able-bodied young fellows like myself should be playing football in England while their husbands, sons and sweethearts were fighting in the sun-baked deserts of Libya and the Middle East, were flying out over Europe or were dying in the dangerous seas. I am not going to defend myself, I have done nothing to defend myself against. The War Moguls ordered that I stayed in England to do my war job. Football was incidental, but in its way it too played a part. I appeared in hundreds of charity matches for England, the Army, combined services and unit sides. Let me make it clear. I didn't ask to stay in England. I cannot recall any centre half who could keep him (Tommy Lawton) in check in his international days-I have seen little of him since and, for all I know, he may be as difficult to control as ever. Tall, powerful, agile and crafty, Tommy was the complete centre forward. He made goals; he scored them with monotonous regularity. With his head or with his feet, they came all the same to Lawton. If one man can do it, so can others. But they must put in the necessary work at practice and I am certain that Lawton was never a shirker in that respect else he would never have obtained the fame he did. Tommy Lawton at his very best was only a fraction behind Ted Drake in my estimation. With his tremendous shooting power and wonderful knack of heading the ball from a high centre, he too, is marvellously equipped for the job of leading a forward line. At an age when many players were still striving to win recognition, Tommy had won almost every honour in the game; and with a view to cashing in on his fame, and to securing his future, he left First Division football and went to the Third Division. Most of the clubs in that section must have blessed his name as they saw the crowds rolling up. There are many angles from which a move such as Lawton made can be viewed, but we've got to say this for it - the move has popularised the game in some of the " backwoods" brought out the customers. Tommy, with his goal-scoring feats, his ability, and his appearances for England, will never be forgotten, and must always be mentioned when these other great centre-forwards are under discussion. Yet I cannot help thinking - and this is another angle of his move to Notts County - that it was a pity he left the highest class of League football when he was still under thirty years of age - still in his prime, you might say. For one thing, he virtually gave up his hope of ever winning his way to the Cup Final at Wembley, which is every player's ambition, or at any rate high up among his aims. Certainly I would not deny the right of Third Division clubs to attract first-class footballers. Don't think I wish to push every Third Division club more firmly in its place. Good luck to them in their aspirations. But can any one doubt that, indirectly, it also cost Tommy his place in the English team, where he seemed such a fixture? The lower standard, in the general sense, of the football to which he took himself must affect any player. The way to keep up to scratch, the way to improve, is to play with and against fellows as good as you are-or a bit better ; although of course that wouldn't be easy for a Tom Lawton at his best. When Tommy was a youth on the Burnley ground staff, he spent hours trying to improve his shooting. Propped against the concrete wall of the terracing were the figures used to show the half-time scores on Saturday afternoons. And in mid-week Tommy used to take a ball out and shoot at these figures, picking out different numbers. He worked away at this for hour after hour, day after day, week after week, until he could shoot accurately and low, picking off the numbers as he thought of them. I have heard people say that Tommy was lucky, and that success came easily to him. They forget those hours of practice; the heart-breaking days when the shots wouldn't connect; the hard labour of striving to make his left foot do the job which nature thought should be done with the right; the tough time he must have had when he played in Second Division League football as a mere boy of sixteen. The Brentford chairman said that Arsenal had permission to talk to me, and he asked me to ring Mr. Tom Whittaker, the Arsenal manager. I couldn't grab the telephone quick enough, and Mr. Whittaker asked me if I would go to see him at Highbury. Believe me, Stirling Moss wouldn't have caught me that Thursday afternoon as I dashed across London. At Highbury, Mr. Whittaker asked me whether I would sign for Arsenal, and all I could reply was, "What a question! Who wouldn't!" The next day, sworn to secrecy, I signed on the dotted line, and played my first game in the red and white shirts the following day against Manchester City. To join Arsenal at thirty-four, towards the end of my career, was beyond my wildest dreams, and I still couldn't believe it was true when I pulled the red and white shirt bearing the No. 9 over my head. My mind kept going back to that day when I was the office boy at Burnley and George Allison rang up to say that he wanted to sign "your centre forward, Lawton". Looking back, I can honestly say that the greatest mistake I ever made in my footballing career was in not joining Arsenal when they tried to sign me from Burnley, but then when you near the age of thirty-five you see things in a different light to when you were young! I can understand why every footballer wants to join Arsenal. To my mind they are the greatest club in the world for two reasons. First, every player is treated as a man and not as a baby, and second, the strict code of honour every Arsenal player must uphold. It says in the Arsenal book of rules, "Remember you are an Arsenal player". Those six words show the tremendous love for the club everyone connected with it has, and the tremendous faith that is put in every employee. Employee is probably the wrong word to use, because at Highbury everyone, from chairman down to the lowest-paid ground staff worker, is regarded as a partner in a great firm, a partner whose job it is to see that the great name of Arsenal is kept unsullied. Take the training, for instance. At most football clubs there is a well-defined routine of training spread over the whole of the week. But at Highbury it is different. There they know a player will get and keep himself fit. Otherwise, of course, he would not be on the Arsenal staff. So you do whatever training you need, and no one will interfere with you. Arsenal don't believe a professional footballer should be watched over like a criminal or like a school child doing his sums. They know he will train. You just don't break a confidence like that. It never occurs to you to take advantage of the system. If a player did, and was not fit for a full ninety-five minutes (Arsenal always play ninety-five minutes, not ninety), then the club knows what to do! I can see some people smiling when they read that. I can just hear the chuckles and the remarks of, 'Blimey, and look at 'em now'. Yes, I know Arsenal is the most glamorous club in the world. I know it is the most famous, and I know it is the most hated. People said that Arsenal played unattractive football and concentrated on defence, but clubs throughout Britain, throughout the world, adopted the Arsenal system of defence in depth. People said that Arsenal never played attractive attacking football, but just look at the number of goals Arsenal scored. And just look at the players Arsenal had - Alex James, David Jack, Cliff Bastin, Joe Hulme, Ted Drake, Bryn Jones ... oh, why go on? People also said that Arsenal bought their success. They had so much money that they roamed all over the country buying all the class players. Arsenal, they said, never made any players, they just bought players other clubs had made. But what about George Swindin, George Male, Eddie Hapgood, "Policeman" Roberts, Bernard Joy, Cliff Bastin, Walley Barnes, the Comptons? They are just a few of the products of Highbury.